Looks like excellent work being done here! Will this system help phase out the old undo method, which if I remember correctly, loads in the entire file again. 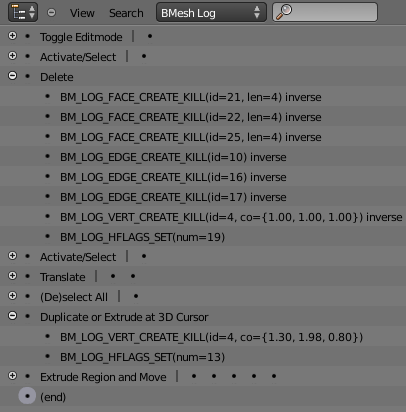 The Blender-wide undo function indeed stores a copy of the entire file, however edit mode (both pre- and post-BMesh) have a separate system that stores a copy of the entire mesh after each action. Storing a copy of the mesh is more efficient than storing the entire file, but of course there are many mesh actions for which it is still quite inefficient. For example, adding a single vertex to a million-vertex mesh requires storing a million and one vertices. With the BMesh logging system, it would only record that a single new vertex was added at coordinates XYZ, which is much more memory efficient. To answer your question, this method might someday replace the current mesh undo system, although probably not any time soon.